Relaxing Lakefront, Quiet, Private, Very Clean. Great for Groups and Families. Chateau / Country House2401 sq. ft. This house is a perfect for a group of friends or a couple of families. Great Hanging Out House. Open floor plan allows all to be together. Open Chef's Country Kitchen with Stainless Steel Appliances. Downstairs rec room for kids, teens and fun loving adults. Plenty of space on all three levels plus outdoor decks and screen room. Please read the reviews from our guests as they will help you get a good feel of the house and how it can work for you. 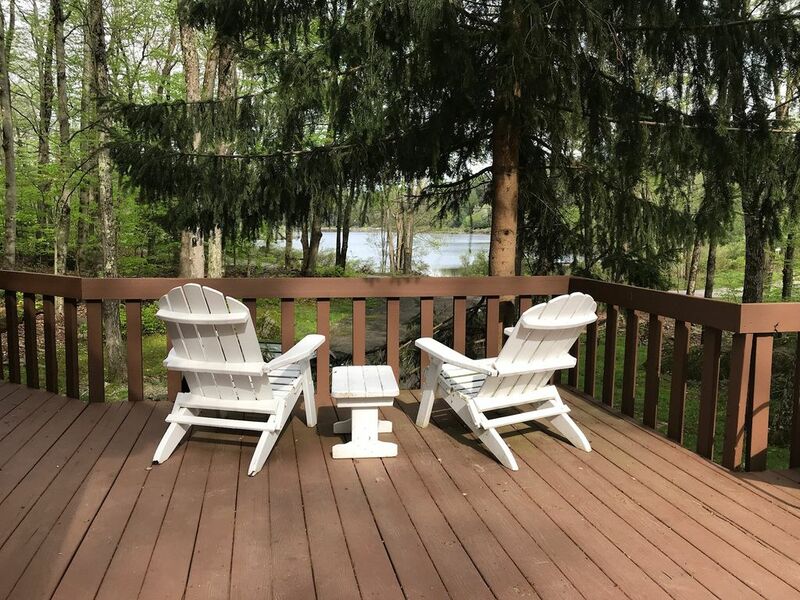 Our house, community, and central location make the Bethel Lake House the perfect five-star rated destination to stay in the Town of Bethel or in Sullivan County. Close to area events, attractions, restaurants and shopping We try very hard to offer great value and convenience for your hard earned vacation dollar. Let us know of any questions. Our spacious, open and fully renovated lake front home is available for rent...as a weekend escape, a three-day weekend in front of the fire, for the summer season or for a long, slow week to explore (also available as an artist's retreat for longer periods)---you choose. Our community....New dog park opened, Fall 2018. Smallwood Forest Reserve with pretty waterfall dedicated Summer 2018 is on the east side of our lake. Ball fields, tennis courts and swimming. Lots of nature in and around the lake. Guests pay a $150 fee for professional cleaning. Quiet, peaceful and relaxing. Abundant wildlife. Kayaking, biking and swimming. Hiking, skiing and nearby attractions. Lake side restaurants, Bethel concerts and events, antiquing and sight seeing. Very clean and well laid out house. Comfortably sleeps nine across three floors. Great rec room with games for all ages. Wraparound decks, screen room, firepit. Sit and watch the ever changing lake views. Enjoy every season at the Bethel Lake House. toilet, combination tub/shower, tub, shower, This is the bathroom pictured. Rural country setting on our private acre with small brook running through. House nicely set back from road. Backs up to acres of woodlands. Walk around the lake is a mostly flat two miles. 44 acre non-motor boat lake. Stocked with five kinds of fish. Life guard protected beach with snack bar. Abundant wildlife in and around the lake. Skate at your own risk in winter. Lake view from all three house levels. Lake views also from deck, screen room and balcony. Quiet corner in loft offers lake view and is perfect for an afternoon read. At our driveway's end crossing the lake ring road is the lake. Our dock is for fishing, sitting and kayak launching. Nighttime stargazing is amazing as are the morning sunrises. Running water sounds. Nearby beginner and family skiing 15 minutes away at Holiday Mountain. If you come to ski tell us and we will give you $50 towards skiing! Water views from inside and outside offer year round views of the lake, Fall foliage and more. Deer gather and look for food most evenings. Bald Eagles & Blue Herons are not uncommon lake skimmers. Use our three kayaks and launch from dock into the 44 acre fish stocked non-motorboat lake. House telephone provided. Free calls in US. Phone stored in charger in downstairs rec room. Mobile handset can be brought upstairs. Cell service good. Better as you move to lake side of house. Air conditioning provided in master bedroom. Other bedrooms have ceiling fans. Each room has a separate heating thermostat providing the exact temperature you want. Linens provided for all beds. Extra linens in closets. Washing machine in lower level utility room. Soap provided. Clothes dryer in lower level utility room. Dryer sheets provided. Indoor wood burning fireplace. We provide wood for first night’s fire. Wood available nearby. Outdoor stone firepit in backyard. 6-8 outside chairs stored in screened room for use around firepit. Parking for up to 6 cars. Clearance ok for small trucks. Space for boat. House comes with 10 sets of bath towels, hand towels and wash cloths. Washer Dryer available to wash towels as needed. Punching bag/gloves to let out some steam. 2-3 kayaks, 4 bicycles in garage, hockey sticks for ice play, rollerblades, kids scooters, some plastic bats/balls. Lake walk is mostly flat 2 miles around. Wireless internet available throughout the house and deck. If connectivity lost unplug and replug in the router. Open floor design allows large families and groups to all hang out. Wood burning fireplace, views of lake and sunrise. Always cleaned and emptied. Ice trays in freezer. Note: The refrigerator works fine. However, if loaded with lots of warm food and drinks it will take a few hours to cool all. Stainless steel large single oven. Yes, electric drip coffee maker. Filters stocked and stored to left of cabinets under the sink. We try to keep a full can of coffee on site. Dunkin Donuts shop less than 1/2 mile away. Paper plates provided. Plastic ware as well. Full set of spices available. Refrigerator is emptied and cleaned after each visit. Napkins, paper towels and garbage bags provided. Yes, settings for 12. Silverware for 10? Generally the house has all the kitchen equipment one needs. If you have a question please ask. Open, airy and accessible design. A Cook's kitchen. There are two TV's connected to cable. Large one in living room and one in master bedrooms. Smaller TV' can be moved around for your XBox or Playstation use or moved to third bedroom. Second floor loft has CD player. radio with speakers that provide for listening in main living area. A few CDs provided. NY Times easy listening is a morning favorite. DVD player attached to main TV in Living Room. Collection of books, travel guides and reference books round out the collection. Kids books in rec room trunk. A high end golf putting green challenges even the best golfer. Adjustable pitches and rolls make this 8 foot long green a fun challenge for all ages. Lots of family games and activities in living room on bookshelf and in rec room. Catch Phrase is popular one. Large floor tic tac toe. Puzzles that can be accomplished in a short stay - Woodstock. Full size regulation pool table. 3-4 pool cues. Please be careful with children using. Craft area/desk in rec room with 'endless' supply of drawing paper. Garage has some sports equipment - wiffle ball/bat, hockey sticks for the iced over lake. A few family style DVD's available. Seasonal renters can plant a garden. Small very private balcony off master bedroom that looks out over woods. The house currently has three kayaks. One is a two seater and the other two are one seaters. Available life jackets are sized from childrens thru XXL. Launch from dock at base of driveway. Four bikes available, bring helmets if desired. Great place to bike ride. Mostly flat lake ring road is a great 2.05 mile ride around. Take bikes to local parks as well. Three kayaks, Two one seaters and one two seater. Life jackets of all sizes available. Fishing rods and tackle boxes available. Large wraparound private deck & screened room. Deck extends 100 feet around the house with chaise lounges, Adirondack chairs, new 2016 custom made picnic table that seats ten. Other assorted chairs. 2-3 kayaks on premise. Launch from our dock. Fishing poles and tackle box available. Bait at Citgo station on way in. Nearby Holiday Mountain offers excellent family and beginner skiing experience. 15 minutes away. Larger mountains for advanced skiers within one hour's drive. Two tennis courts are across the lake up the hill or drive around. Nearby golf courses. Ask for details. The house is spacious, clean, warm, has all the necessities for cooking. Bonuses are a game room and kids toys in the basement and sleds/scooters in the garage, the kids would never get bored. We have also enjoyed walking around the lake and skiing at the Holiday mountain. I would recommend this rental for both winter and summer vacation. We have stayed twice at this house; it’s clean, quiet and comfortable. Communication with the owners is great. Plus, a friendly doe and her two fawns paid us to a visit on two occasions; looking for a snack. Thankfully we had a few apples to share; it’s a treat to enjoy the local wildlife. Wonderful host, lovely home! We enjoyed the fireplace, lake and the local deer who came to visit! Very clean home with lots of pots, pans, glasses, bakeware and more! Beautiful views of the lake and friendly local deer who came to visit us every day. Kevin, the host was very accommodating, and made sure we had everything we needed as well as providing the local newsletter with upcoming events and attractions. The deck is wonderful, and although it was snowing when we visited, I enjoyed sitting and watching the fog on the lake in the morning. My husband, dog Joe and I went to Kevin's cabin for 2 nights. Kevin was so accommodating and kind when booking with him. The house is great, I love how open the first floor is! We went for some great walks, stayed inside and cozied up to a fire and enjoyed some much needed rest and relaxation. We fed a family of deer, they even ate out of my husband's hand! Beautiful sweet animals, we got so many apples and carrots the cashier asked if we had horses. We had a lovely time. Thank you! What a wonderful house. Laura and Kevin have thought about EVERYTHING. We had never done a VRBO so wasn't sure if we needed to bring sheets, towels, hairdryer, etc.... Well they thought of it all. Extras too. Just enjoyed so much sitting by one of the sliding glass doors and looking out at the lake. Also watching deer walking across the driveway. Husband even commented how charming the house was decorated. Very comfortable. Plenty of games from pool table to board games. Truly something for everyone. The house was warm and inviting. Sat outside on one of the benches and just enjoyed the cool air in the mornings. House had different spaces for all different ages. That is important to us. A large family would not be on top of one amother here. Loved that aspect! The Town of Bethel was brought to the world's attention in 1969 when nearly 500,000 people gathered at Max Yasgur's Farm for 'Three Days of Peace and Music'. The Woodstock festival was held here in Bethel, 5 miles from our lake house, not in the Town of Woodstock. In 2006, Bethel Woods opened on the original Woodstock site as a state-of-the-art performing arts venue. In early 2008, a multi-media Woodstock 'interpretive' museum opened near the old Yasgur's Farm to complement the concert space, which has hosted the New York Philharmonic, Wynton Marsalis, Diane Reeves, Chris Botti, the Goo Goo Dolls, the Boston Pops Orchestra, Crosby, Stills, Nash & Young, Lynyrd Skynyrd/Marshall Tucker Band, Bob Dylan, Richie Havens/Arlo Guthrie, Earth, Wind & Fire, the Boston Pops Orchestra, Steely Dan, the Allman Brothers, the Jonas Brothers, Heart, Journey, Cheap Trick and Brad Paisley to name a few. The continue to add top artists each summer / fall seasons. Lawn chair rentals make it affordable for all. If you can not make the concerts it is still a great place to visit and tour the Woodstock Museum. This museum is quite the unexpected treat. Original artifacts, music, history, movie clips and much more. Group tours given on Saturdays. Easy 1 to 2 hour tour. See the actual festival site, hills and ponds.